Preheat oven to 350°. Coat two standard 12-cup cupcake pans with cooking spray. In a small sauce pan, combine your selected fruit add-in with ¼ cup sugar. Bring to a boil, reduce heat and simmer for 8 to 10 minutes until filling thickens, stirring frequently. Repeat in a separate sauce pan with each flavor. In a medium bowl, combine cake mix, eggs, oil and water. Beat for 3 minutes. Pour into prepared pans and bake for 18-20 minutes. Allow to cool for 20 minutes. To make cake pops: Crumble 8 cupcakes into a large bowl. Stir in one of the fruit fillings. Roll and shape into 1 ½-inch balls. Line a baking sheet with waxed paper. Place the balls on the sheet and freeze for 20-25 minutes. Repeat with remaining cupcakes and fillings. To make cake pop coating: In a small bowl, microwave the white chocolate for 30 second intervals, until melted. Stir in oil until smooth. Remove the cake pops from the freezer. 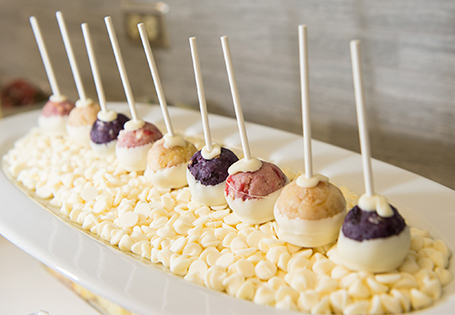 Dip each stick 1/4-inch into the chocolate, then insert into a cake ball. Dip each cake ball halfway into the chocolate. Place cake pop onto a waxed paper lined sheet pan. Allow chocolate to harden. Tip: Reheat the chocolate between each batch of cake balls. If cake balls become too soft, return to freezer to harden.